One might suspect it’s a fiction that that the writer and woman Midori Osaki was born over a hundred years ago in 1896 in Tottori Prefecture, a place far removed from the capital city of Tokyo. Isn’t she in fact a contemporary writer, sitting back somewhere in Tottori with a knowing smile on her face, distantly watching the world’s remarkable changes? Osaki’s writing is so fresh it provokes such thoughts. Just as Kafka never gets tired, Osaki, too, never gets old. This film is Sachi Hamano’s newest adaptation of Osaki’s writing, after having created and directed the 1998 film, “In Search of a Lost Writer: Wandering the World of the Seventh Sense” (“Dainanakankai houkou?Osaki Midori o sagashite”), which investigated the mysterious life and work of Midori Osaki, and “Lily Festival” (“Yurisai”), a film that caused an international sensation in its portrayal of the sexuality of the elderly. At a time when Osaki’s name had remained relatively unknown, Hamano’s first work on the author attempted to destroy the myth about her unhappy late years, depicting the portrait of a female writer who lived resolutely through turbulent times. This time, Hamano took on the ambitious task of adapting to the screen the essence of Osaki’s literary world?something yet to be fully understood. “The Cricket Girl” (“Korogijyo”) is the title of a novella popular among Midori Osaki fans. This novella, along with two others, “The Walk” (“Hoko”), and “A Night in Anton’s Basement” (“Chikashitsu Anton no ichiya”) were written at the psychological and stylistic peak of Osaki’s career. The distinct world created by her novel “Wandering the World of the Seventh Sense” leads to these three works?the very destination of Osaki’s literature. Though they are separate novellas, they all have common characters, and depict a strange and endearing picture of the divided nature of the human psyche. The film “The Cricket Girl” interprets these three works as one story sequence. The beauty and preciousness of a strange and fantastic love?in Osaki’s stories, infatuations are structured in such a way that there is neither a desire for a reaction from the object of love, nor a transformation of one-way love into something mutual. In her writing, by considering the possibilities of a world that exists apart from reality, or by enlarging the notion of love (for example, going beyond relationships between men and women to include the those between humans, animals, plants, and minerals), Osaki retracts her author’s eye out to the cosmos in order to look deeply into the human heart. This is a tale that seems all the more relevant in an age that has given rise to stalkers and explosive violence, or to other social phenomena of contemporary Japan, such as hikikomori (people who feel compelled to shut themselves out from society), or NEET (a generation of citizens who are “Not in Education, Employment, or Training”). And yet, Osaki tackled these contemporary themes completely alone. She wrote “A Night in Anton’s Basement” in her thirties, even as she fought an addiction to migraine headache pills. “Anton” was to be her last novella. As director, Sachi Hamano’s quest was to take the world built upon Midori Osaki’s alchemy of language?reputed as being difficult to grasp?and unleash it into the realm of film, thereby brilliantly reviving Osaki’s surrealism and distinct humor in the depths of contemporary audiences’ hearts. In her own time, Osaki was so involved with film that she had been considered one of Japan’s first female film critics. She had even hoped to adapt her own writing into films. 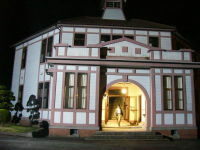 It was thus that Sachi Hamano embarked on a new adventure, of filming the entire movie on-location in Tottori Prefecture. 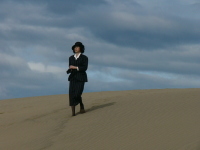 During filming, it was important to keep in mind that while Osaki was deeply influenced by the contemporary international arts that had been brought to Tottori, she also sought to incorporate into her work the scent of nostalgia she caught in the wind and air of her homeland. In Tokyo, a throwback film taking place in the 1930s could only be shot in a studio. But in Tottori, architecture that traces three distinct historical periods?Meiji (1906-1912), Taisho (1912-1926), and Showa (1926-1989)?remains a part of the space of everyday life. These are buildings and spaces that breathed the same air as Osaki. On-location filming took place for nearly three weeks in May 2006. Filming began in Kurayoshi City of central Tottori, moved west to Yonago City, and then east to the town of Wakasa. The fourth location, in the town of Iwami, was for Hamano a return after eight years. Just as with the previous film, Osaki’s birthplace, Iwai Hot Springs, became the designated home base for all filming in Tottori. From there, the cast and crew made short trips to Tottori City and the nearby coast of Uradome. Although this made for a “drifting film troupe” that was unable to settle down anywhere for very long, having a hot springs at each location helped ease everyone’s fatigue. Being able to take full advantage of using national heritage sites and heritage objects during filming could not have been done without the active support of Tottori Prefecture and its various towns and cities. Inevitably, there were various difficulties to face, but in each case people from both the government and the private sector volunteered to support the film’s needs. In this way, three eccentric tales of love spun by the lonely dreams of Midori Osaki were revived in one contemporary film. It is as if Osaki is telling us: there is no need to fear loneliness, for the fantasy-like love existing in our hearts belongs to another world that is beautiful and abundant. Machiko Ono lives in the country with her grandmother, when one day a psychology researcher and a friend of her brother’s, named Tohachi Koda, visits. He asks Machiko to read aloud some lines from a play. Though at first hesitant, Machiko eventually reads the romantic lines over several days, and after Tohachi leaves, spends her days dreamily pining for his memory. This first example of love portrays the fleeting and faint unrequited feelings of a young girl, set off by words of love in a play. In the second scenario, Machiko visits one self-confined poet, Kyusaku Tsuchida, to deliver a box of ohagi sweets (sticky rice covered in sweetened red bean paste) and a jar of tadpoles. The ohagi were made by Machiko’s grandmother to give her strength; the tadpoles are sent by a zoologist named Dr. Matsuki. We learn that Dr. Matsuki is the husband of Kyusaku’s sister, who has been concerned with Kyusaku ever since he wrote a poem about crows flapping their white wings. Having heard that Kyusaku is now writing a poem about tadpoles, Dr. Matsuki has taken the trouble to hatch some tadpoles in his laboratory, and send them to the poet. As a scientist who runs experiments on how pigs’ noses stretch toward bread, Dr. Matsuki is an emotional rival of Kyusaku. Upon seeing Machiko, who gazes at the tadpoles and sighs deeply, Kyusaku realizes that the girl has fallen in unrequited love. Though he usually falls for such girls, who are caught up in an unrequited or broken love, he claims that when he actually falls in love, he can no longer write love poems. He thereby chooses to distance Machiko from himself. Before doing so, however, Kyusaku teaches Machiko a poem that might cheer her up in sad or painful times. This second example of love is a poet’s love: it seals off love in the real world so that love poems might be written. In the third scenario, we encounter the Cricket Girl. She is introduced to us as an archetype of sorts: a grown-up version of the kind of girl who falls in unrequited love, pines for someone’s memory, and communes with tadpoles. The object of the Cricket Girl’s love is the British mystical poet, William Sharp, and his lover Fiona Macleod, whom she finds out about out from the depths of the library stacks. We learn that Sharp and Macleod wrote passionate love letters to one another, but actually, they were part of two separate hearts?one male and one female?that coexisted in a single body. With this couple as the object of her love, the Cricket Girl is seen as someone whose love transcends both time and space. Not one of these three instances of love bears fruit in the actual world, and they remain a kind of dream or mirage of the lonely. But perhaps it’s just as well, for we see that none of the characters involved actually desires to be “coupled,” per se. One key phrase in this story is “the study of split identities,” which refers to “the arbitrary name for a nonsensical psychology” invented by Midori Ozaki. It is humorously taken to mean the divided psychological nature not only of humans, but also of animals. As we observe one character in the story traveling around Japan collecting information for this discipline, we begin to understand that “the study of split identities” is an affirmation that the existence of humans and animals is something comical. Midori Ozaki thus calls out to the present: even if you are alone, have no fear. In your heart, there is another reality spun by words, and this fantastic love−this is what is beautiful. Author Midori Osaki was born in Tottori in 1896. Although she wrote several masterpieces in Tokyo in and around 1930, in her mid-30s she became addicted to headache medication, and her parents forced her to return to her hometown. She never wrote novels again, living through World War II and the post-war years as a dedicated caregiver to her nieces and nephews. At one point in literary circles, she had even been called “a lost writer,” assumed dead after going mad. In 1979, however, the first collection of Osaki Midori’s literature was published, and found a new audience. Recently, the contemporary relevance of Osaki’s works is being re-evaluated. 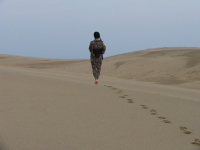 In 1998, filmmaker Sachi Hamano adapted Osaki’s representative work, “Wandering the World of the Seventh Sense” (“Dainanakankai Hoko”) to the big screen. “The Cricket Girl” (“Korogijyo”) is Hamano’s second film based on the work of Osaki, and was supported by Tottori Prefecture. Hamano’s previous film, “In Search of a Lost Writer: Wandering the World of the Seventh Sense” (“Dainanakankai hoko?Ozaki Midori wo sagashite”), received high international acclaim for its effort to re-evaluate a lost female artist and reexamine the unexplained second half of her life. This time, Hamano interprets three novellas written before Osaki put her pen to rest forever?“The Walk” (“Hoko”), “The Cricket Girl” (“Korogijyo”), and “A Night in Anton’s Basement” (“Chikashitsu Anton no ichiya”)?as a single series, and adapts to the big screen the essence of Osaki’s literary world. Though frequently cited as difficult, Osaki’s literature, newly transposed to the world of film, can now fully reveal her inimitable and eccentric humor. Born in 1948, Sachi Hamano decided to become a movie director while she was in high school. She came to Tokyo and sought a way into the world of filmmaking, but at the time the Japanese movie business was male-dominated, and there were almost no studios willing to hire women as potential directors. However, beginning in 1968, she worked as an assistant director in several independent production companies, and made her directorial debut in 1971. In 1984 she founded her own production company, Tantansha. Since then, working as both producer and director, she has released over 300 films portraying sexuality from women's perspectives. In 1998, she produced the independent film, “In Search of a Lost Writer: Wandering the World of the Seventh Sense,” (“Dainanakankai houkou?Osaki Midori o sagashite”), which depicted the life and work of the forgotten female writer Midori Osaki. Funding for that film was provided in part by donations from over 12,000 women from all over Japan. Hamano was awarded the 4th Women's Culture Prize in 2000; that same year, she encountered Hoko Momotani's novel of elderly sexuality, “Lily Festival” (“Yurisai”), and decided to adapt it for the screen. She completed production on “Lily Festival” in 2001. 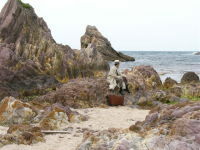 In 2006, she again adapted the work of Midori Osaki, creating and directing “The Cricket Girl” (“Korogijyo”). Sender: Nippon Cine Arts Co., Ltd.